Hello XXXX -- so it's summer! And even as I write, the sun is shining, the air grows increasingly warm and soporific (huh, I've only written one sentence and I'm falling asleep already! ), someone is watering their lawn, and is that a BBQ I can smell...? First, fancy some pool-side jazz? Hot jazz with a cool dip? How about swimming into the sunset, luxuriating in a steam room, enjoying a drink from a donation bar and something to eat from a donation BBQ? Sounds like a very good plan to me... but you'll have to hurry. 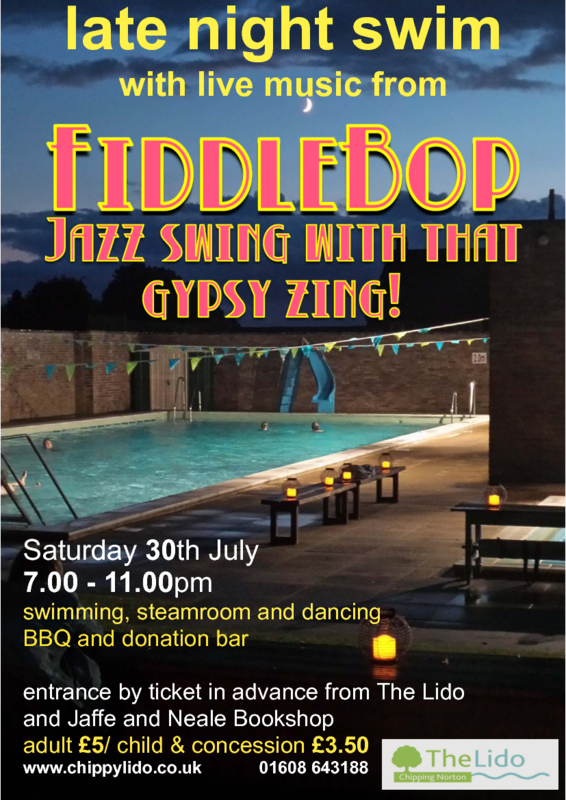 THIS EVENING (Saturday 30 July), FiddleBop are playing at Chipping Norton Lido (The Lido, Fox Close, Chipping Norton, Oxon OX7 5BZ) , from 7.15 pm. Entry is £5 adults, £3.50 children, with all proceeds going to this locally-owned and run 'pool with a social conscience'. For more, see the Lido's Facebook page. Then next weekend, it's a new venue for us: The Fox Inn, Chipping Norton (Market Place, Chipping Norton, Oxon OX7 5DD) from 5.30 pm on Sunday 7 August. 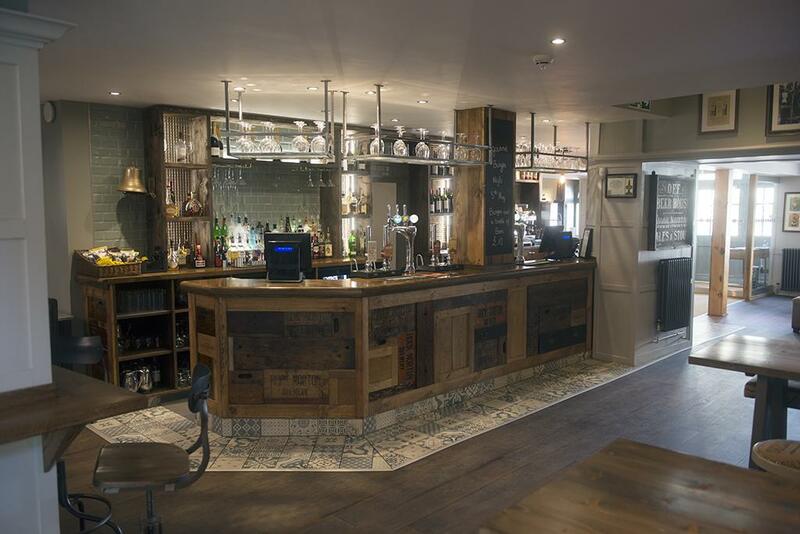 The Fox is a rather splendid newly-refurbished 16th century inn in downtown Chipping Norton. And a very nice place it is too, with a great warm welcome guaranteed... So let's make the Fox ring with FiddleBop's gypsy jazz swing! See you there? And there's more... on Sunday 14 August from 5 pm, FiddleBop return triumphantly to The Nag's Head On The Thames, Abingdon (The Bridge, Abingdon, Oxon OX14 3HX). Fancy chilling to the sound of jazz and flowing water? How about coming to the gig by water (some did, last time we played there)? But however you get there, this one will be a cracker, an exemplary way to wind down on that perfect August afternoon, yeah! Bank Holiday Monday, that's Monday 29 August, brings FiddleBop back to The Norman Knight (Whichford, Shipston-on-Stour, Warwicks CV36 5PE)! 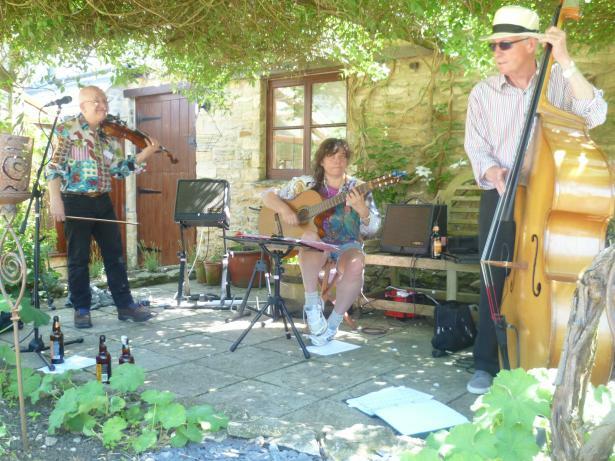 We're following Whichford Flower Show, so from 6 pm we'll be busy creating our own hot-house atmosphere, bringing hot-jazz-with-that-gypsy-swing back to this fine pub, with equally fine food and drink. How about joining us? That's all for now, folks. Another FiddleBop newsletter will (all being well) follow in a few weeks. We hope to see you at a FiddleBop gig soon... but wherever and whenever we see you next, one last thing: please raise a glass to Jo's wonderful Mum, Sonia Davies (3 July 1925 – 14 July 2016). 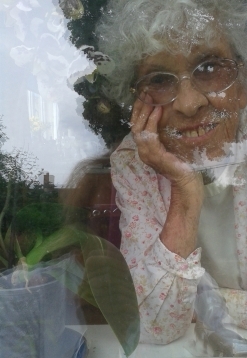 Here she is, smiling through the front window of her house. For sure, we'll miss your smiling face at our gigs, Sonia. So... All the very best to you XXXX, see you soon! PS How about that FiddleBop and-swim, this evening? This list is correct at the time of writing, but the list of gigs on our website is always up to date. When is it? Venue, occasion, whatever... Where is it? 8 pm Wednesday 28 September 2016 The Stratford Alehouse "Shakespeare CAMRA Pub of the Year 2016"
"The World's Premier Django Reinhardt Gypsy Swing Venue"
This list is correct at the time of writing, but the list of gigs on our website is always up to date. And for the latest and greatest, most up-to-the-second info on FiddleBop's small doings (do you really want to know? ), see http://www.facebook.com/FiddleBop. PS We hope that you are happy to receive these email newsletters. If not, then tell us so, and we'll shed a tear at your leaving: email us at info@fiddlebop.org.